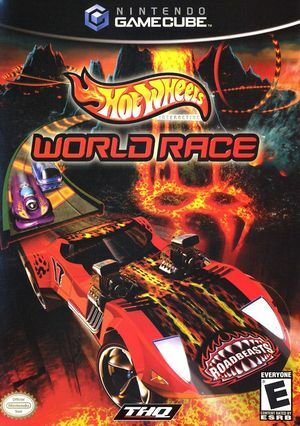 Hot Wheels: World Race (aka Hot Wheels: Highway 35 World Race in Europe) where life revolves around the Hot Wheels World Race circuit--a series of races involving treacherous jumps, challenging competition, and death-defying loops. This is the life you've chosen and you'll need a good team and a dependable Hot Wheels car to survive. When you're ready, you'll tear up the tracks, jump to extreme heights, and collect pickups to trigger shortcuts. Becoming champion of the Hot Wheels tracks won't be easy, but you can always practice with a friend in head-to-head races. The game is based on the movie and TV series of the same name released by Hot Wheels and Mainframe Entertainment. The THQ logo video doesn't play correctly in between the blue copyrights screen and the Climax logo screen. A black screen shows and the THQ sound just plays. To fix, just set the Texture Cache to position 1 (safe) or 2. See issue 8519. The Widescreen hack has clipping issues that can be fixed with a Gecko Code. Disable the Widescreen hack before using. The graph below charts the compatibility with Hot Wheels: World Race since Dolphin's 2.0 release, listing revisions only where a compatibility change occurred.